Taganga is a small town located in a picturesque bay just over the hills from Santa Marta. While probably not on a must see list for Colombia, the view of the bay’s flanking hills running into the sea is quite pretty and is worth the time to check out if you have the time. Read on for a complete travel guide to Taganga, Colombia where you will learn how to get there, available accommodations, and what to do in Taganga. View of the fishing boats in the bay you will see if you visit Taganga. So, several years back, when I first moved to Colombia and Cartagena, Taganga was a popular destination as a party and hangout spot for backpackers visiting Colombia’s northern Caribbean coast. Besides boasting gorgeous surroundings, the town had a proliferation of hostels, restaurants, and even a budding nightlife. However, the town seems to have suffered a bit of a decline. Looking at travel forum posts there seems to have been some problems with robberies, and as of my last visit in July 2018, the town’s infrastructure has not improved much since 2011 when I arrived in Colombia. There was also a high profile issue with an Israeli-run hotel that doubled as a drug and prostitute den. At the end of the day, Taganga looks like what it is, a small fishing village that turned into a tourist destination. It’s not clear that tourism really has benefited the local population that much, and behind the tourists came the all too common by-products of drugs, prostitution, and petty crime. This, along with several bad droughts leaving much of the town’s population without water for periods recently, seems to have caused a bit of resentment by some of the locals. All that being said, I’ve visited Taganga a number of times and have never had any problems nor felt threatened in any way. It’s hard to say sometimes if things you read in travel forums are exaggerations or simply only hearing from the people with bad luck. It seemed on our last visit, that Taganga had been supplanted by Palomino (which reminded me a lot of Taganga a few years ago) as the trendy backpacker spot to chill out while traveling to Tayrona and/or heading north to Cabo de la Vela and Punta Gallinas. So, it may be worth checking out Palomino if that’s what you’re looking for. There are a number of dive schools in Taganga as well. My understanding is while the diving itself is not incredible, it’s a relatively cheap place to get your diving certificate. Getting your dive certificate at a fraction of the price of elsewhere is one of the popular things to do in Taganga. While the beach is small and there are prettier ones outside Santa Marta, like Bahía Concha or the beaches in Tayrona National Park, and I wouldn’t categorize it as a must see on a visit to Colombia’s Caribbean coast, Taganga is still worth checking it out if you have half a day or so to kill while in or around Santa Marta. The view of the bay, especially when you’re coming in, really is beautiful. Below I will give you a run down based on my visits to the town. In this travel guide to Taganga, you will learn how to get there, available accommodations, and what to do in Taganga, Colombia. 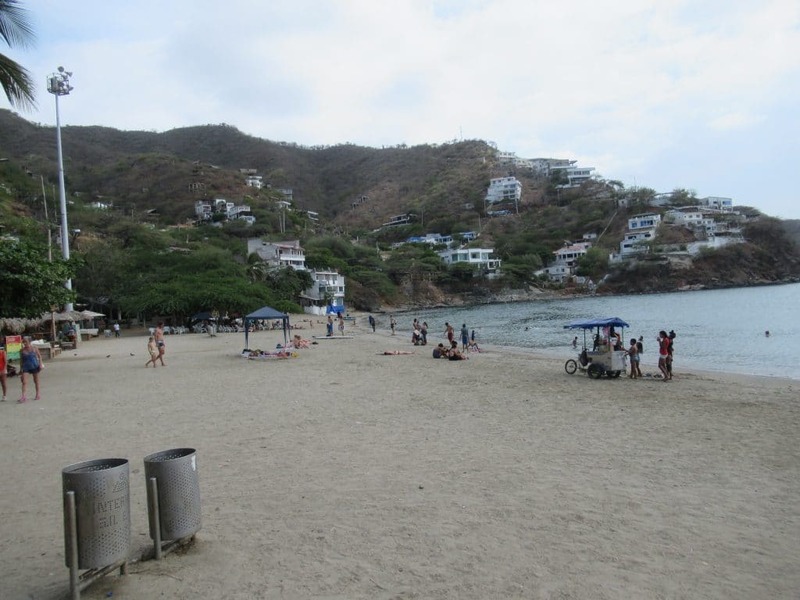 The cheapest way to get to Taganga is to arrive to Santa Marta first and get a bus. You can get buses to Taganga from the market in downtown Santa Marta that go over the hill to Taganga. It should take about 15 minutes to get there. You can also take a taxi from downtown Santa Marta, which shouldn’t be too expensive. If you’re coming from the interior, you can fly into Santa Marta. Check out flights on Colombia’s flagship airline Avianca. If you are trying to get from Cartagena to Taganga, you have a few options. Marsol also offers direct service to travel to and from Taganga from Cartagena and elsewhere on Colombia’s Caribbean coast. Berlinas offers service to Santa Marta from Cartagena, every 40 minutes beginning at 4:40 am (6:00 am on Sundays and holidays). I’ve found Berlinas service to be much better than Marsol’s. You will have to get transportation from Santa Marta to Taganga. Finally, you could get a bus from the main terminal in Cartagena to Santa Marta, then follow the above instructions to get to Taganga. Assuming you are staying in the tourist areas of Cartagena, I’d suggest Berlinas or Marsol. The terminal is a ways away from downtown and the cost of a taxi there will wipe out the money you save on the cheaper bus. There are a number of places to stay in Taganga. You can find cheap hostels and nice hotels, including a few on the hills overlooking the bay. I imagine depending on the place, you can find a place to stay in Taganga for a full range of different budgets. Every time I’ve ever spent the night in Taganga, I’ve actually stayed at one place. I’ve stayed there twice with my wife Susana (well once before she was my wife) and once when my mother and sister visited. While it’s not a budget option, it’s a great place to visit with your significant other or if you have family visiting. That place is Casa los Cerros. It lies on a hill at the edge of town and offers an absolutely beautiful view of the bay below. Casa los Cerros is owned by a Frenchman and his Colombian wife, who basically had a beautiful house with a sweet pool and a great view and decided to build a few tiny additional villas that they rent out. 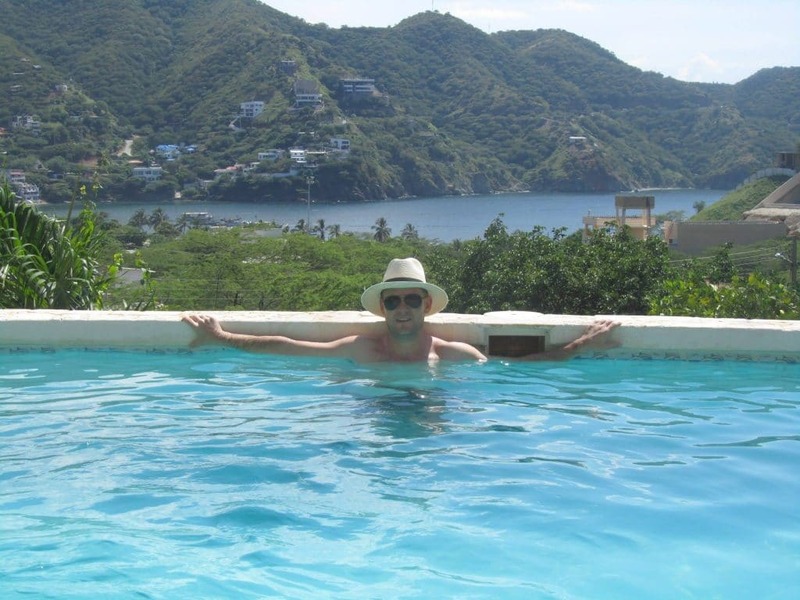 Chilling in a pool with a view like this, makes Casa los Cerros one of the best places to stay in Taganga. Jean-Luc and his wife Ana are terrific hosts and they will give you a great breakfast with a big, delicious fruit bowl along with eggs and toast overlooking the pool. They also offer lunch and dinner and have a fully stocked refrigerator in your room with extremely reasonable prices (I don’t think you can beat 2,500 pesos for a beer in a minibar anywhere). Additionally, with only 3 rooms, you have a fair chance to get the gorgeous pool and the view it offers all or nearly all to yourself. I’ve been extremely pleased staying at Casa de los Cerros, and if you choose to spend a night in Taganga, I encourage you to check them out. The 150,000 pesos nightly price is definitely worth it for the luxury. Make your reservation at Casa Los Cerros at hotelscombined.com or hotels.com. If you’re looking for more budget options for places to stay in Taganga or hostels where you can meet fellow travelers, there are no shortage. Given the crowds are lower than they used to be, it probably isn’t necessary to make a reservation before hand, but you may want to at least do some pre-scouting of places to stay. Taganga is a little beach town, so that’s the main attraction. In my opinion, the beach itself is nothing to write home about. It’s small and doesn’t boast the same type of clear water that other beaches on Colombia’s Caribbean coast offer. But you can still take a dip or enjoy a beer in the sun. Most worthwhile on a visit to Taganga though is the view of the bay. There’s something special about seeing the foothills of the mountains running into the sea (the Sierra de Santa Marta is the tallest coastal mountain range in the world). Hanging out at the beach or grabbing fresh fish for lunch at one of the little restaurants along the water front is nice and makes a visit to Taganga worth it (expect to spend 15-20,000 pesos for a fish plate with soup, rice, patacones, and salad). Also, diving is one of the popular things to do in Taganga. And, as mentioned above, if you’re looking to get your diving certificate, there are a number of diving schools in Taganga. You can also do a trip to one of the nearby beaches or to Tayrona National Park by taking a boat from Taganga. For what it’s worth, I took the boat from Tayrona back to Taganga, and it was a pretty rough ride so that may not be the best idea if you get queasy bouncing over the waves on a boat. 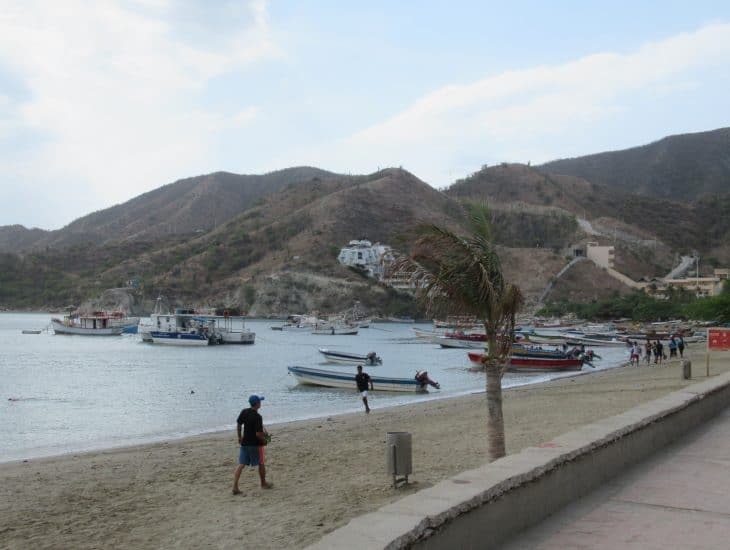 Hanging out by the beach for a beer or lunch is one of the things to do in Taganga. Given some recent issues with crime, it might be best not to be out too late at night or to stick to hanging out at places around the main strip and that are a short walk back to where you are staying. Be sure to pack lots of sunscreen. I recommend Coppertone Sport, which holds up great in the water or sweat from the Caribbean sun. Taking along insect repellent is a good idea too. I recommend OFF! Deep Woods. In conclusion, while it may not be a must see stop on a tour of Colombia’s Caribbean coast, you can enjoy some luxury if you decide to stay at Casa los Cerros. Even if you don’t decide to spend a night, you can still get some fresh fish for lunch and enjoy the picturesque view of the hills flanking the bay during a on a day trip to Taganga. If you do decide to visit Taganga, I hope you find this guide useful. Ready to plan your trip to Taganga? Interested in learning more about sites along the Caribbean Coast? Check out our guide to Palomino, a great alternative (or complement) to Taganga about 90 minutes to the north. Check out our guide to Tayrona National Park. Boats to Tayrona leave from Taganga daily. Check out our guide to Minca, a beautiful, little mountain town just outside of Santa Marta and easily accessible from Taganga. It especially makes for a great break from the sun and heat of the coast. 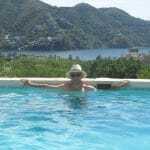 This entry was posted in Other Destinations and tagged Caribbean Coast, Other Destinations in Colombia, Santa Marta. Bookmark the permalink.